And while sausage is also not an everyday food for me, I do especially like it when it one or two subtle flavors (in addition to the requisite pork (or chicken or turkey) flavor) shine through. In the case of the Faicco's sausage served on the pizza at John's, this refinement arrives in the form of fennel. It pops up approximately every other bite and brings a bit of savory to the otherwise cheesy and tomatoey affair of very good coal oven pizza. Faicco's sells many varieties of sausages, butchered and sliced meats, cheeses, sandwiches, and other top-notch Italian food products. The fennel sausage is made daily from pork shoulder, fennel seeds (Egyptian imported), salt, and pepper. New York is quite blessed with a multitude of very fine pork stores - businesses that are usually not only about sausage and meat, but generally feature other extraordinary foods. The parsley and cheese sausage at Anthony's, which was once on my corner (but is now a bank), was my personal favorite. Thankfully, I still have Esposito's nearby (aside from great sausages and cuts of meat, they make an excellent homemade tuna salad and an eggplant parmesan that is one of the best I've ever had - whoever said vegetarians can't shop at pork stores?!!). And in Greenwich Village, Faicco's remains a real gem of a shop. 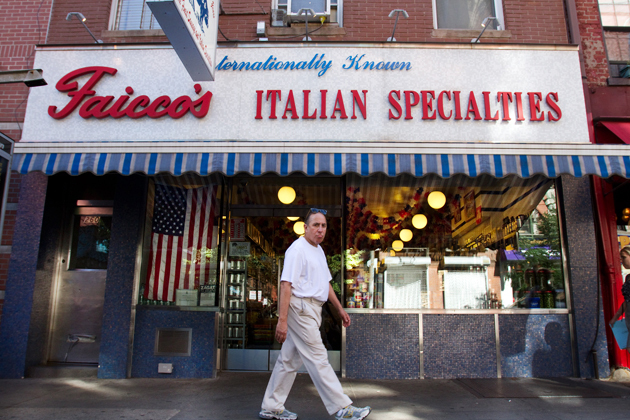 Originally established in 1900 on Thompson Street, Eduardo Faicco, an immigrant from Sorrento, moved his shop to Bleecker Street in the 1940s. 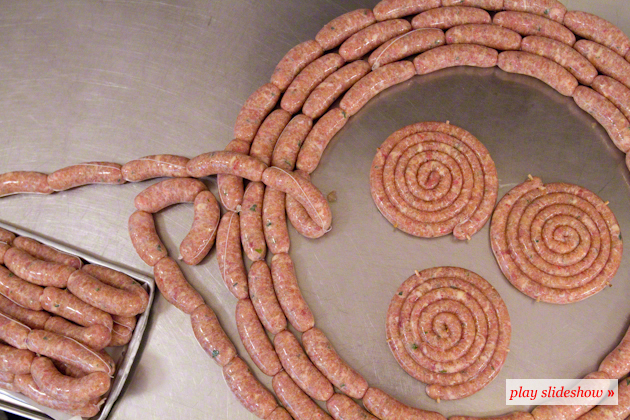 Click the photo above (of coiled and pinwheeled chicken sausage) to navigate a few more photos from my recent visit to Faicco's. Or better yet, stop by Faicco's for a properly made Italian hero, or a pound or two of excellent homemade sausage. Map Faicco's (two locations); Map John's Pizza (four locations) (call ahead for days/hours).